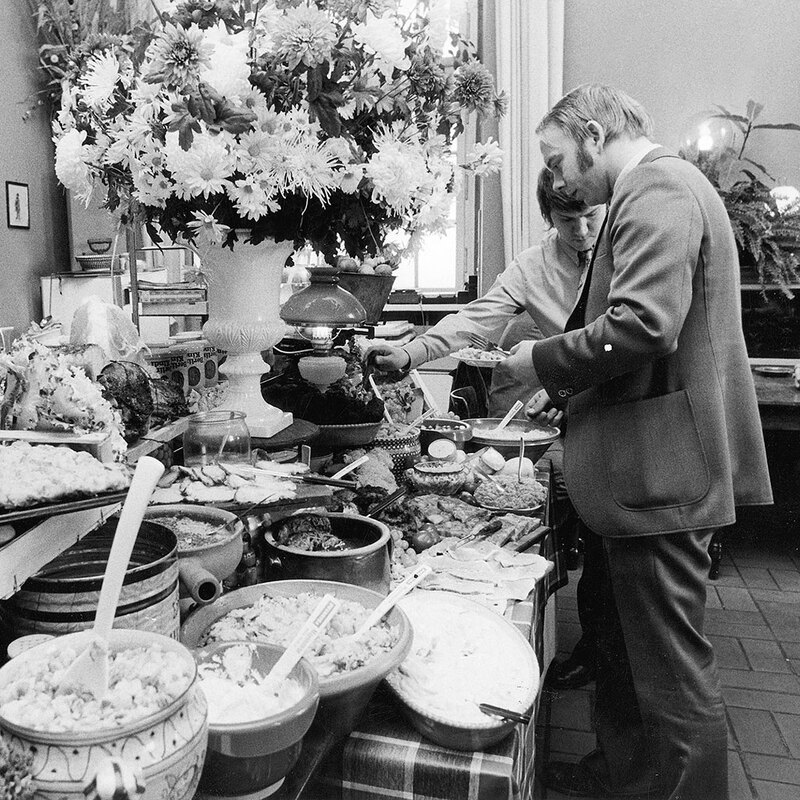 The epitome of American gluttony—the all-you-can-eat buffet—actually originated as a much classier and much more European affair. While enormous spreads of food were a common sight during medieval feasts, the Swedes were the first to formalize and give a name to such an endless meal. In the 16th century, it became a common Swedish practice prior to a more substantial feast to welcome arriving guests with a brännvinsbord, meaning a “table of spirits.” Though it consisted of finger foods like bread, butter, cheese, cured meats and smoked fish, the star of the brännvinsbord was the traditional spiced vodka—known as Brännvin—that was served. Often distilled from potatoes or grains, Brännvin would later be joined on the table by beer, schnapps or aquavit. The Swedish tradition first gained international fame at the 1912 Stockholm Olympic Games, when the city’s restaurants put out smörgåsbords for the hungry masses that had flocked to Sweden for the games. At the 1939 World’s Fair in New York, Americans got to enjoy a traditional smörgåsbord at the Three Crowns restaurant inside of the Swedish pavilion. While there’s no evidence that he attended the 1939 World’s Fair, perhaps accounts of Sweden's “smörgåsbord” inspired El Rancho Vegas employee Herb McDonald, who made the buffet a culinary mainstay in the United States only a few years later. Las Vegas in 1945 was not the Vegas we’ve come to love (and sometimes hate) today. It was just beginning to blossom from a sleepy desert town to a lawless desert mecca of vice. 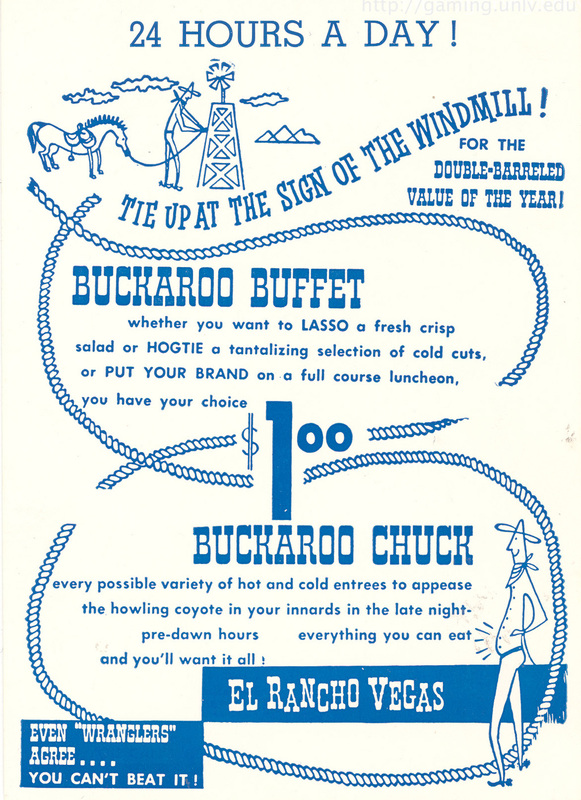 Five years before Bugsy Siegel opened the Flamingo, the El Rancho Vegas opened its doors and became the first casino/resort on the soon-to-be infamous Vegas Strip. Originally run by Thomas Hull, the casino was the forerunner of everything we associate with Vegas today—glitzy accommodations, bombastic shows, popular restaurants and all-night partying. It was also where the all-you-can-eat buffet first became an American staple. The legend goes that late one night in the mid 1940s, Herb McDonald was working on the casino floor when a case of the midnight munchies struck. He went to the kitchen and brought out cold cuts, cheese and bread to make himself a sandwich at the bar. Passers-by at the 24-hour casino took note, asking McDonald if they could partake. Realizing a full meal would take them away from gambling, McDonald laid out a spread—a Swedish smörgåsbord for the hungry gamblers if you will. It was a hit. Soon, McDonald and El Rancho Vegas launched their all-you-can-eat-dinner 24-hour spread, the “Buckaroo Buffet," costing customers only a dollar. The casino lost money on its buffet (for the most part, they still do), but profits weren’t the point. The whole objective was to keep patrons inside and gambling as long as possible. Today, there are likely thousands of all-you-can-eat buffets nationwide, In Las Vegas alone, there are at least 40. The next time you bask in a room full of sneeze-guard-protected chafing dishes full of fried chicken, pizza, London broil and stir-fry, you can thank Sweden for introducing this culinary marvel to America. And Las Vegas for perfecting it.